I read an article in the paper yesterday about proposed supermarket plans to slash beer prices during the World Cup. It's anticipated that some retailers will discount prices to such an extent that a pint will cost just 48 pence. The article went on to suggest that this is another nail in the coffin for English Pubs, claiming with certainty that the public would shun their local in preference for staying home and drinking supermarket beer. 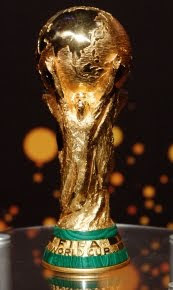 The World Cup comes around once every four years. It's still some way off, but already colleagues and friends are planning where and how to watch each match. It's an event to look forward to, an excuse to come together with mates and have a bit of a laugh whilst chilling out and supporting your country. England's lack of a settled goal keeper, dodgy referee decisions and unfair penalty shoot outs become the most important things in life and when those handful of England games are on, all other plans go out the window. Speaking from personal experience, World Cup games are watched in one of two settings. At the pub. They'll have a big screen TV and it'll be packed. Perfect for the atmosphere that you don't get when sat watching it on your own. People you've never met before become your best mates, as you ride that ninety minute roller coaster together, sucking teeth and erupting in unison as the action unfolds. The fact that beer is a few quid cheaper at Tesco isn't important. It's the World Cup! It's only on every four years! Damn the expense, that's the last thing in mind. Then there's the party at home. Everyone's invited and the bloke with the biggest TV plays host. If it's sunny there's a BBQ going on outside and everybody brings beer as an entrance fee. You don't quite get the atmosphere of the Pub, but home was chosen for the comfort, the space and for the direct control over food and environment. Alcohol is sold at a loss to drive footfall, that's a fact that isn't argued against by many. Rightly or wrongly it's being accused of having a devastating impact on Publicans around the country. But to claim that events like the World Cup will provoke a spike in stay-at-home drinking is, to my mind, pretty wide of the mark. People look for reasons to have a good time and big sporting events are the perfect excuse to indulge. Whether it's getting out and down the pub to soak up the atmosphere or inviting people around for a gathering, the prospect of saving a few quid is irrelevant. I don't disagree with your assesment Chunk but I'll make a related point: the big supermarkets are able to get incredibly low prices from the national brewers because the national brewers are running scared in a declining market. How can the national brewers afford to do this? They charge the pub trade an extortionate amount for draught beer to offset the lack of margin in canned/bottled beer. Therefore the price of beer in the pub is a rip off and the price of beer in the supermarket is a give away. And in a way it's a bit of a Mexican standoff - will the very profitable on-trade volumes eventually decline so much that it can't support the off-trade give aways? Of course it will. The off-trade price will have to rise and the pub industry will be (more) decimated. That's why the footie promotions will contribute to the terminal decline of the pub industry.